Lt. Col. Harry Drayton, Jr. 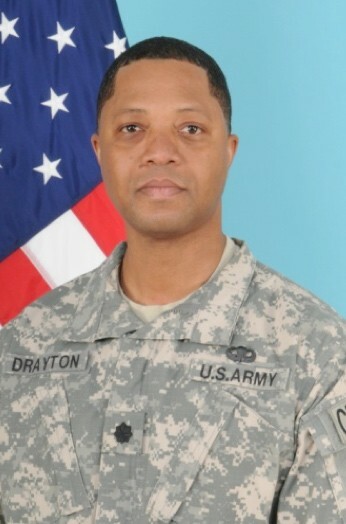 Lieutenant Colonel Drayton will assume command of the 92nd Chemical Battalion located in Decatur, Georgia on 14 April 2013. He was commissioned as a 2nd Lieutenant in 1991 from Fort Valley State University. Shortly after his commission he attended the United States Army Chemical School in Fort McClellan, AL. where he was instructed as a Chemical Officer. Drayton was then actively assigned to the 3rd Infantry Division in Schweinfurt, Germany. Military Awards and decorations include Army Service Ribbon Medal, National Defense Service Medal, Army Commendation Medal (w/ 2OLC), Armed Forces Reserve Medal (w/M device); Army Achievement Medal, Army Reserve Components Achievement Medal; the National Defense Medal, the Global War on Terrorism Service Medal, and the Airborne Badge. LTC Drayton received his high school education from Alfred Ely Beach High School (Savannah, GA) a Bachelor of Science degree in Zoology from Fort Valley State University in 1991 and completed Intermediate Level Education (ILE) by graduating from the United States Army Command and General Staff College (Fort Dix, NJ) in 2011. LTC Drayton currently works as the Continuous Improvement Coordinator Manager at John Deere Commercial Products. He and his wife Chiquita currently reside in Grovetown, GA with their daughter Sydney and son Ontorio -“Tory” (Iowa State University).